State officials bungled the recent rollout of a new unemployment filing system, rushing out the beleaguered software with little training or care for the down-on-their-luck people seeking benefits even as the department’s leader fostered a toxic atmosphere of neglect and ordered complaints to be destroyed. That’s according to an internal memo marked “confidential,” obtained by the Morning Sentinel, that was written by a Department of Labor employee but never made public. Sen. Shenna Bellows, D-Manchester, also obtained the memo, separately from the newspaper, and said she contacted the writer of the document, who didn’t want to be identified. Bellows said what she has learned from whistle-blowers within the labor department is “very troubling,” adding that the new system was rolled out despite objections and concerns from employees about the functionality of the system, called ReEmployME. More troubling, she said, was the allegation that senior management was involved in the destruction of documents from claimants requesting help. Bellows said that if everything in the confidential document and what she has learned from other employees with the department is true, those responsible for the destruction of records need to be held accountable. “And honestly, if senior-level employees in the department were involved in actively covering up a problem, they should lose their jobs,” Bellows said. There is no name attributed to the author of the internal department memo, which the Morning Sentinel obtained at the end of January. Nor does it say for whom the document was intended or when it was written, saying only it is a confidential communication not to be distributed. Meanwhile, the memo writer’s most serious allegations have been confirmed separately in recent weeks by the Morning Sentinel by two former temporary department employees with firsthand knowledge of the new claims program. Those two employees spoke to the Morning Sentinel on condition of anonymity because both fear retaliation as they themselves are now unemployed and seeking benefits. Their temporary status working with the bureau was confirmed through documentation and also through Bellows. Claims in the memo shed new light on growing concerns surrounding the controversial rollout of Maine’s new unemployment claims system. The system has come under fire from people seeking benefits and from lawmakers, who have criticized its shortcomings and have probed its problems during recent legislative hearings. Faith Young, 62, of Fairfield, is among those people who found frustration and no help navigating the system. Young, who described herself in an interview as a “victim of the unemployment mess,” said she had been locked out of her ReEmployME account online. She called for help, but without much luck. She once waited for six hours on the phone but still couldn’t reach anyone. She’s since gone to the career center in Bangor, but her questions went unanswered. “I feel like they fed us out to the wolves,” Young said from her home on Feb. 9. The claims of the memo writer and the two former employees are aimed directly at John Feeney, the director of the Bureau of Unemployment Compensation, and his immediate associates. Among the serious claims in the memo are that Feeney oversaw a cover-up of system problems, with documented records of complaints ordered to be destroyed. The Maine Department of Labor did not respond to multiple requests made in recent weeks for an interview with Feeney, nor did it comply with multiple Freedom of Access Act requests, though it did acknowledge receipt of the requests sent by the Morning Sentinel. Feeney, a retired naval officer, was hired in the summer of 2016 to implement the new system, called ReEmployME. He originally planned to launch the system on Oct. 31, 2017, but found the software was not ready, so he put it off until December 2017. Front-line staff and middle managers who were expected to implement the new program were led to believe that the system had been launched successfully in Mississippi and a lot of the “bugs” had been resolved. Nevertheless, Dale Smith, the deputy executive director of the Mississippi Department of Unemployment Security, told the Legislature’s Committee on Labor, Commerce, Research and Economic Development that the launch had created turmoil in Mississippi. When the program was to be implemented in Maine, the bugs had not been resolved. Even now, “hundreds of computer software problems continue to arise,” the memo writer said. The memo writer includes an excerpt from a report that then-Department of Labor Commissioner Jean Paquette prepared for Gov. Paul LePage that describes how the department formed a consortium with Mississippi and Rhode Island to replace Maine’s claims system with a shared system built upon Mississippi’s model, receiving $90 million in federal funding to support the consortium. The software for the system was created by Tata Consulting Services, a multinational information technology company that is a subsidiary of the global conglomerate Tata Group, based in Mumbai, India. Tata was supposed to modify the system for Maine, the labor department employee who wrote the memo said, but the software still has buttons and tabs from Mississippi that aren’t relevant to Maine. Claimants were provided with instructions for the ReEmployME program, but the labor department memo writer wrote that claimants were misled when they were told they could use the same user names and passwords they used on the old system. That caused thousands of claimants to lock their accounts unintentionally because they used too many password attempts. Labor department planning called for five phone lines and five temporary staff members and voicemail to provide help to claimants. However, senior management limited technology support to setting up an initial account, managers and team leaders were the only ones allowed to unlock an account, and only supervisors could reset a password. As the memo writer said, when 3,000 people can’t get into their accounts, the staff gets overburdened quickly and spends the entire day unlocking accounts. During the time the new system first was being rolled out, first-time claims and continued claims surged as they traditionally do when seasonal workers are laid off. According to Department of Labor estimates, an average 1,491 initial claims were made each week in the four weeks of December starting Dec. 2, while the average for the previous four weeks was 940. During the four weeks ending Jan. 27, the average was at 1,454. The four-week average for the period ending Feb. 27 was 841. Continuing claims rose from an average of 4,753 per week in the four weeks ending Dec. 2 to a four-week average of 6,242 in the period ending Dec. 30. The four-week average for the period ending Jan. 27 was 9,031 per week. The average for the four weeks ending Feb. 24 was 9,537. For a while, voicemail was collected and the staff tried to respond by working overtime, weekends and holidays. More temporary workers were brought in to help while claimants went without benefits over Christmas, the memo writer said. Claimants were told to go to a career center or a library to use a computer even though career center staff members were not trained to solve the problems that kept cropping up. Many claimants filed over the phone for their weekly benefits. The new system required claimants to file their work search history online, so even if they wanted to use the phone, they still would have to go online. The memo writer says about 600 or 700 people successfully filed over the phone but were still locked out of their online accounts and therefore could not collect their benefits. “The result of the defects, system errors, blocked and locked accounts was that a large number of claimants could not file their claims within the 14-day period required and accounts began to be shut down,” the memo writer says. On Jan. 13, Feeney dispatched a letter to claimants, warning them they had to complete their claims online or lose their benefits, the memo writer wrote. Most did not get the letter until Jan. 16, four days before the filing deadline. Letters denying benefits to those who were not able to solve their problems or complete their claims online went out Jan. 22. The only way to unlock an account and set up a new one was to call the technology support line and have a support person walk the caller through the process. It took a “week or two” to get the OK for the support personnel to unlock accounts and reset passwords, according to the memo writer. All messages left on the tech support line – about 200 per day – after Jan. 10 were not returned, the labor department employee wrote in the memo. Email replies tell claimants to call an 800 number. The 800 number is overburdened with claimants on hold for hours, then disconnected or told to call back later, the memo writer says. The document writer relates that a basket with some 1,000 unreturned voicemail messages was taken by one of the managers to Feeney and has not been seen since, and the staff was told not to take any messages. The voicemail message line was shut off without warning to claimants. Bellows, the state senator, said the state should investigate “how many hundreds of Mainers were improperly denied benefits they were entitled to,” have those benefits restored and ensure something like this never happens again. “Everything I’ve received tells me the department is not ready and should not unveil the new system for the employer side,” Bellows said. Young, the Fairfield woman who’s struggled to apply for unemployment benefits, said she was almost evicted from her apartment because she hasn’t been getting her checks. She pays her rent with what she receives from Social Security, and the unemployment funds are meant to cover other bills. But her bank account has been wiped out because she hasn’t been receiving unemployment benefits. She was thankful she was able to work out an agreement with her landlord to pay later, but she’s still struggling. Young, who worked for more than 10 years in customer service, most recently at Anthem Blue Cross Blue Shield, said even for computer-savvy people like herself, the new system is confusing and easy to get tripped up on. Young is doubtful that such a problem can easily be fixed. “ReEmployMe is one of the worst systems I’ve ever seen,” she said. What’s worse, according to the two temporary contract workers, is the attitude of the bureau. Before Feeney made changes, morale was positive, they said. “I loved working there, especially when they gave us the ability to help these people,” one of the former employees said. The two department employees said the claim of user error being the culprit is bogus. When the system was first rolled out, one said, there were times when a claimant used the incorrect case for their user name or password, and that was initially an easy fix; but then claimants were essentially shut out of their accounts both online and through the phone. In an email exchange provided to the Morning Sentinel by the employees, Feeney instructs employees that they are to handle only technical issues, and if a claimant calls with a problem or question about claims to refer them to the toll-free 800 number. Both employees described Feeney as wanting claimants to stop calling. They said he eventually had the voicemail function on a help line turned off. Employees were told to stop documenting complaints on the computer and instead to write down claimant names on slips of paper, which ultimately were put into a box that later disappeared. Hundreds of pieces of paper were packed into a box until it was overflowing. The box was taken to Feeney’s office and never seen again. “That box was overflowing,” the second employee said, with nearly 300 claims written down and stuffed into it. The two employees said they were aware of instructions to destroy the claims and heard from sources within management that the records were shredded. There is an email from Feeney providing instructions on moving away from the tech support line. The second employee said Feeney’s public claims about the phone lines being open and waits being short were false, and that people are afraid to come forward from within the department, fearing retaliation. Both employees said many people within the bureau want to do the right thing and help people but are limited by Feeney and others close to him. Both described morale as so low it was nonexistent and the fear of retaliation palpable. Both were fearful of what might happen to them, but they decided that the actions of the Bureau of Unemployment Compensation were so repulsive they needed to speak up. Both former employees and a handful of others ultimately were let go ahead of their contract schedule. Feeney and Smith appeared before the Committee on Labor, Commerce, Research and Economic Development in the State House on Feb. 8, nearly a month after the committee first requested such a meeting, which initially was denied. While the purpose of the meeting was to address L.D. 1770 and the language dealing with employers and benefits paid, legislators criticized the shortcomings of the system and the timing of its release. Smith and Feeney defended the system. Both maintained it’s impossible to roll out a system this large without a few mishaps along the way. Rep. Ryan Fecteau, D-Biddeford and co-chairman of the panel, had moved to add revisions to the bill that would have allowed claimants to file over the phone. While most of the steps for filing can be done over the phone, the only way to provide a work search history is by logging on to an account on a computer, which is the source of many complaints. 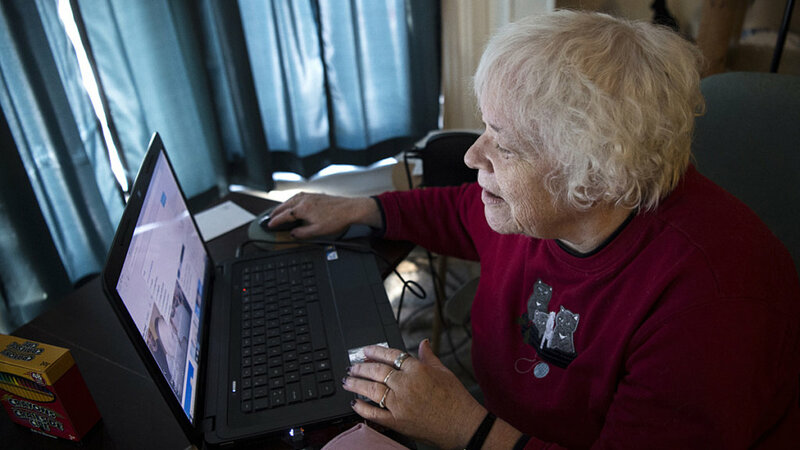 Members of the panel expressed concern about older Maine residents or those living in rural areas who don’t have access to a computer or a reliable internet connection. At the Feb. 27 hearing, Bellows, the state senator, said she also had heard that people were afraid to come forward about the faults within the system, fearing retaliation. Bellows also confirmed what the two former employees had told the Morning Sentinel, that the voice mail was shut down and claimants couldn’t even leave a message about their neglected claims. The legislative committee met again Tuesday. Legislators continued to express their concern about the system and decided to move forward with a bill that would require the department to allow claimants to file their work search histories in alternative ways, such as by phone or in person. Bellows, Fecteau and Rep. James Handy, D-Lewiston, each expressed a lack of confidence in the system. The next day, Bellows and Fecteau held a “tele-town hall” conference call, in which hundreds of Mainers called in about the problem. Others are expressing their frustrations with the system on the labor department’s Facebook page. When the department posted on Facebook on March 5 that ReEmployME would be down for maintenance, users began posting about their troubles. One wrote that he had been trying to file his weekly claim all morning, only to be told there was an error. He said he had seen a lapse in benefits before. The department told him to contact the Bureau of Unemployment Compensation with questions and that there are often long wait times during high-volume times of the year. In an earlier interview, Frank Doughty, of Waterboro, said he hadn’t received an unemployment check since before Christmas. Like others, he calls the bureau in the morning. He calls multiple times, often with long waits that end with the line going dead. “It’s pretty frustrating,” he said. A military veteran who also worked on submarines, Doughty, 68, said he is no stranger to work. He’s been working since he was 15 years old. Until now, he has been out of work only a few times. Doughty doesn’t do well with computers. He doesn’t own one. The new system requires him to travel regularly to the Springvale career center for help. Despite all his efforts to find work, Doughty doesn’t think employers are seriously considering him. And still, all this time later, he hasn’t received an unemployment check. “We’re just trying to survive,” he said.